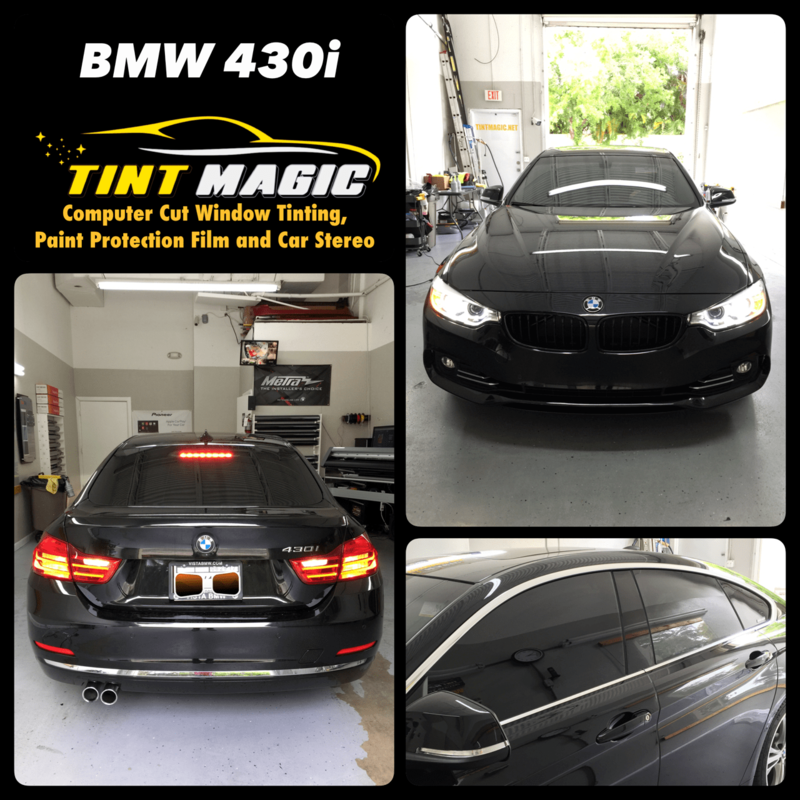 BMW 430i at Tint Magic Window Tint Coral Springs, Parkland, Coconut Creek, Tamarac, Margate, Boca Raton, Sunrise. Call us for a free estimate! (954)840-7883. The 430i is the new 428i (which never displaced 2.8 liters), and it packs a reworked 2.0-liter turbocharged four-cylinder with 248 horsepower and 258 lb-ft of torque (increases of eight and three). What was the 435i last year is now the 440i, and its new 3.0-liter turbocharged inline-six spins up 320 horsepower and 330 lb-ft, up 20 and 30 over last year’s 3.0-liter six. Both engines are based on the modular family of three-, four-, and six-cylinder designs developed to reduce manufacturing and development costs across BMW’s lineup. Fuel-economy estimates are currently unavailable. Bimmer engine-code nerds will want to note that the new four is the B46 and the six is the B58, and they replace the N26 and N55. Wireless-device charging and a Wi-Fi hotspot now are included with the Enhanced USB and Bluetooth package. On 440i models, a nappa-leather-wrapped steering wheel now is standard. Special-order paint, trim, and leather from the BMW Individual catalog can no longer be ordered on four-cylinder examples. M4 models get the Adaptive M suspension, formerly a $1000 stand-alone option, as standard equipment along with the above changes. Pricing stays basically steady with few exceptions, such as the $50 bump in the 440i’s base price over the 2016 435i. At the lowest end, a 2017 430i coupe starts at $42,845, while the 440i xDrive convertible is $59,995. The M4 coupe and convertible each cost $500 more than before, at $67,195 and $75,695. All-wheel drive adds $2000 to any 430i or 440i model. Unlike in Europe, BMW doesn’t offer Americans a badge-delete option, which would put a definitive end to displacement guessing games. So you’ll have to remember BMW’s new rule for these cars’ second numeral: three means two (liters of displacement), and four equals three.